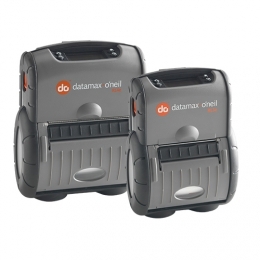 With the RLe Series from Honeywell you receive high quality, highly robust label printers for mobile usage, with long battery lives. The RL Series produces receipts, tickets and sales slips in either 3-inch RL3e or 4-inch RL4e media widths. With a resolution of 203 dpi 8 dots/mm and up to 102 mm per second, these printers are nearly as fast as desktop printers. Fast print results at up to 102 mm/sec. Their robustness is their top feature certified according to protection classes IP54 with protection case and MIL-STD-810F, the RL Series is robust enough to continue reliably producing labels even after 26 consecutive drops from a height of 1.8 m. The double-walled magnesium die-cast housing also easily shuns extreme climates ranging between -20 and 50C. Perform media changes easily from the top, without investing a lot of time, to increase operation times. Communication with the host occurs either corded via USB or RS232 or optionally wirelessly via Bluetooth 4.0 or Wi-Fi 802.11 a/b/g/n.